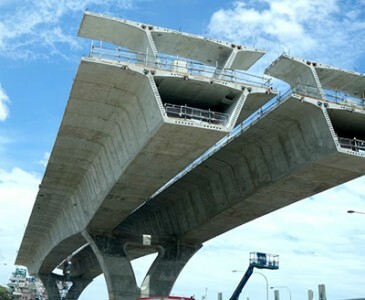 The Urban Superway project involved the construction of 2.8km of elevated roadway, supported on CFA pile foundations for the Department of Transport, Energy and Infrastructure, South Australia (DTEI). This was the first major road project in Australia where an alternative design based on CFA piles was accepted as the foundation solution. FSG provided end-to-end geotechnical design, constructability advice and testing services to Urban Superway JV (USJV) throughout tender and delivery phases. The site is underlain by a sequence of alluvial deposits overlying Hindmarsh Clays which comprise highly overconsolidated clays with sand lenses. The conditions are locally highly variable and difficult to reliably predict. A statistical approach was adopted to develop a robust design which didn’t require excessive design finessing or detailed verification requirements during construction. The design of the structure imposed large lateral loadings and compatibility requirements on the piled foundations. The key to success of the foundation solution developed by FSG was developing a detailed understanding of the site stratigraphy and translating the results of the DTEI test piling and CPT probing program into to a robust design solution. FSG proposed large groups of 1050mm diameter CFA piles to around 30m depth. A total of around 700 CFA piles were adopted in the final design solution. Gaining client approval for the use of CFA piles was critical to tender success and FSG played a key role in providing the necessary technical and construction related advice to achieve this. 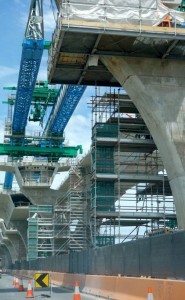 FSG played a key role in providing the necessary technical and construction related advice to achieve this. FSG interfaced with the structural designers to carry out geotechnical design of the foundations at tender, preliminary and detailed design stages incorporating full design certification. Over the course of the project FSG were engaged to design a number of other foundation, retention and ground improvement elements, provide constructability advice, test and sign off the piles. FSG proposed an innovative foundation solution and played a key role in the successful tendering and delivery of this high profile and technically challenging project. FSG’s ability to address not only detailed technical issues, but also address construction risks was a key aspect of gaining client approval and proved to be a key element of project delivery.